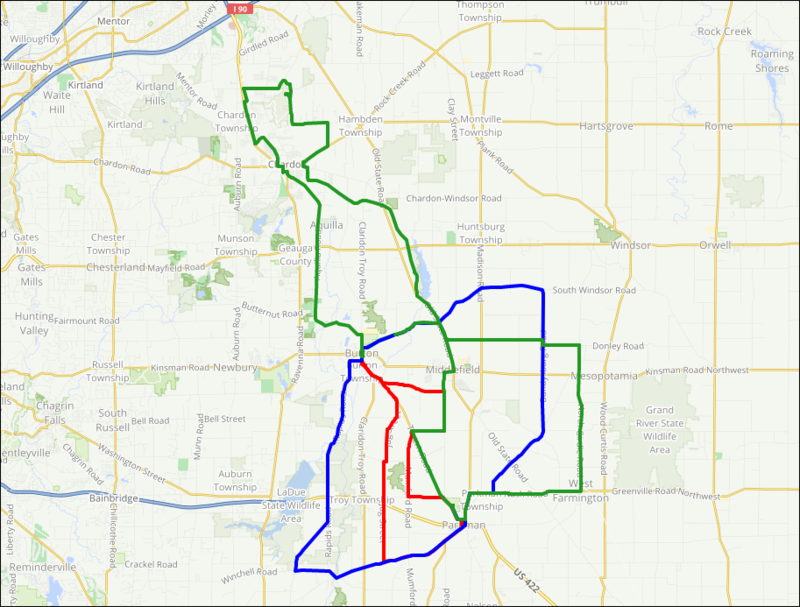 Route Maps w/ Cue Sheets (PDF), and GPS Routes: Today, all online registrants will receive a special email with public links to all three color-coded routes at the RideWithGPS route planning site. At RideWithGPS site, you can download your ride distances needed color-coded route(s) to your GPS device. Also, attached to the email will be all three route color distance maps plus cue sheets in a single PDF file formatted to print on (8.5 x 11″) paper that allow these four ride distances – 25, 40, 65, and 105 (65 +40 mi in order) miles. Click to Download 41st-Sunday in June PDF route maps with cue sheets, and RideWithGPS routes for data file creation/export. We use these three (Yellow, Green, & Orange) traditional route marking and map colors, alone or in combination, to offer these three new route mile distances, 25 (Yellow), 40 (Green), 65 (Orange), and 105 mile (Orange + Green) for your leisurely or exhilarating ride across Geauga County’s beautiful Amish Country! Ride “Sweep” Policy: All riders still on a course at 4:00 PM will be picked up by SAG and transported to route start at Century Village per agreement with local law enforcement. Finally, high-quality color printed maps with turn-by-turn directions (cue sheets) will be available at the pre-registered (online) and same-day registration tables at Burton’s Century Village – your route start/finish point at 14653 East Park St, Burton, OH 44021. Thank you, and we’ll see you this Sunday morning on June 11th! Note: Warm to Hot weather is forecasted, so bring at least two (2) water bottles, drink adequate fluids during your ride, and look for our water-only stops added to the 65 mile route at about the 35 mile and 55 mile marks! What time will.registration be opened? Registration will open at 6:30 am on Sunday.